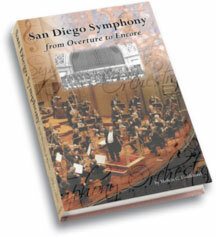 The San Diego Symphony...a story as fascinating as the city itself...this book tells the complete story and takes you...From Overture to Encore. This is the compelling tale of the exultant highs and near-death lows of your San Diego Symphony from its humble beginnings in 1910 through to the successful, solvent present day. Celebrate the San Diego Symphony’s Centennial with this remarkable tale of bravery (often), folly (sometimes), and a community’s determination that the Symphony would survive and thrive. Pick up your copy today, now for only $15.00, at the Gift Shop or Ticket Office (619.235.0804) or Buy Online Now! Price includes tax, and books ordered online will need to be picked up from the Ticket Office. New Centennial Epilogue now included! Dr. Melvin G. Goldzband, Archivist of the San Diego Symphony, has been involved with the San Diego Symphony Orchestra since 1962. He served on the Symphony Board for many years, and continues to be a strong supporter. Retired after a long practice in clinical psychotherapy, Goldzband lives in San Diego and continues to consult with the Symphony. “This superb volume is one of the best additions to the San Diego history bookshelf in years. Goldzband is much more than just another certified psychiatrist, although that background sadly is useful here. Present for much of this history, he paid attention, often participated, and now has recorded the roller-coaster annals of the orchestra very much as they happened, warts and all. I’m impressed with how much of this often incredible story he has rescued for posterity. Even more surprising is what a terrific read this is, a real page-turner with an epic ebb and flow that sometimes rivals adventure fiction." Note: All proceeds from the sale of this book go directly to the San Diego Symphony.